Desperate times call for desperate measures. And the Hell Is For Hyphenates version of desperate measures is to organise an episode in slightly the wrong order. Anarchists, we. As we said in the episode announcement, we felt it was incredibly important to this month focus on Iranian filmmaker Asghar Farhadi. With the USA imposing a draconian travel ban on select Muslim countries, Farhadi has chosen to protest the policy by staying at home instead of attending this year’s Oscars ceremony. This despite him receiving a Best Foreign Language film nomination for The Salesman. 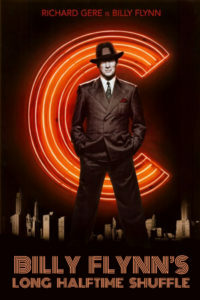 The real actual Japanese poster for Chicago, and definitely not something we photoshopped in like five minutes. We enlisted the help of Tehran-born, Toronto-based film critic and author, Tina Hassannia, an expert in Farhadi’s films and author of Asghar Farhadi: Life and Cinema. The insight Tina brings to this episode as a critic, as someone who has spoken directly with the filmmaker, and as someone familiar with the culture depicted in Farhadi’s films is unique and fascinating. Long story short, this is a great episode. Before we get to Farhadi, Sophie and Lee cast their eyes over three of this month’s films, including Ang Lee’s adaptation Billy Lynn’s Long Halftime Walk, which was released in the USA and Australia last year, but has only this month made it to British shores. They then look at the ups and downs, pros and cons of crafting a sequel to an iconic work, as Danny Boyle finally makes good on his decades-old promise to reunite Renton, Begby, Sick Boy and Spud in the unusually-titled T2: Trainspotting. Then, social and scientific progressiveness come together as they always should with the engaging and crowd-pleasing biopic Hidden Figures, based on the book by Margot Lee Shetterly and directed by Theodore Melfi. After the reviews are done, Tina joins us to talk about what role awards shows have in activism. Following Meryl Streep’s rousing Golden Globes speech and David Harbour’s viral Screen Actors Guild call to arms, do award winners have an obligation to use the spotlight to get political? Or should the glitz and glam of red carpets be done away with completely during times of suffering? 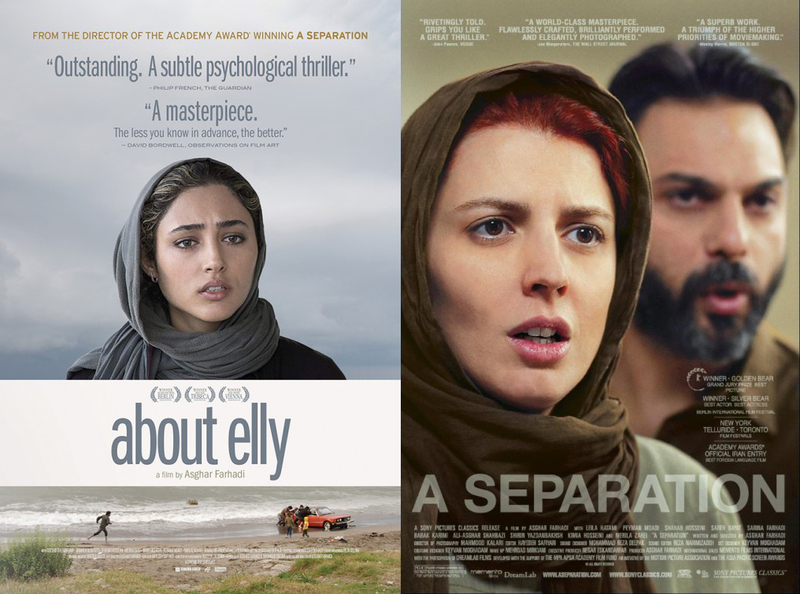 We then dig into the films of Farhadi, looking at Dancing in the Dust (2003), Beautiful City (2004), Fireworks Wednesday (2006), About Elly (2009), A Separation (2011), The Past (2013) and The Salesman (2016). We examine the social and political context of his work in a discussion that will be interesting even if you’ve never seen any of his films. But we’re not done yet! 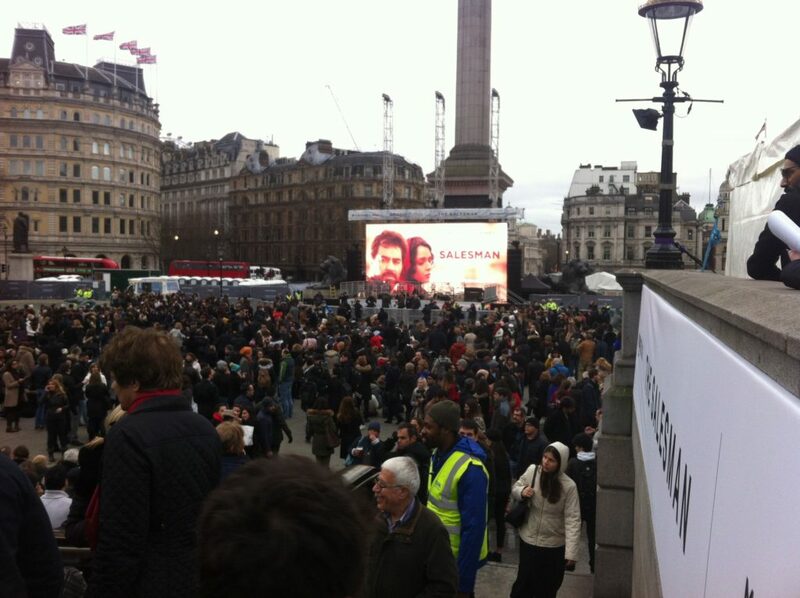 In a special bonus segment, Sophie heads to Trafalgar Square, where the City of London hosted a special screening of The Salesman in an open air cinema. The screening, which took place about 24 hours before our episode was released, saw an estimated 2 000 people in attendance. We hear select speeches from TV presenter and journalist Mariella Frostrup, model and actress Lily Cole, London Mayor Sadiq Khan, filmmaker Mike Leigh, and in a specially-recorded video message, Asghar Farhadi himself. If you’re wondering what our introductions referred to, click through for details on the Bowling Green massacre and the Swedish “major incident”. Our thoughts are with the victims of these not-made-up tragedies. We kick off this month’s reviews with a look at Billy Lynn’s Long Halftime Walk (which has just received a release in the UK), directed by Ang Lee. For more Ang Lee talk, listen back to our Ang Lee episode with guest Julia Zemiro. We take a look at Danny Boyle’s T2: Trainspotting. To hear our thoughts on the first Trainspotting, as well as all the other Danny Boyle films, listen back to our Danny Boyle episode with guest Sarah Ward. Sophie refers to articles contrasting Danny Boyle and Antonia Bird (listen back to our Antonia Bird episode with guest Kate Hardie). The articles, which have the same opening paragraph, appeared in Bomb Magazine, and you can read the Antonia Bird piece here and the Danny Boyle one here. The Manchester film and media school Danny Boyle is helping to launch will teach 1000 students each year from diverse backgrounds. The book that Hidden Figures is adapted from is called Hidden Figures: The Story of the African Women Who Helped Win the Space Race and is by Margot Lee Shetterly. It can be found in book stores and all the familiar online places. We refer to some recent protest speeches at awards ceremonies. You can check out Meryl Streep’s Golden Globes speech here, David Harbour’s Screen Actors Guild speech here, and Ken Loach’s BAFTA speech here. Sophie refers to the Fine Young Cannibals returning their awards in protest after the Brit Awards screened a video message from Margaret Thatcher. We couldn’t find a video of the 1990 moment, but it is referenced here in The Guardian. Sophie also mentions the red carpet protests from Raising Films. Check out their manifesto on Red Carpet activism here. 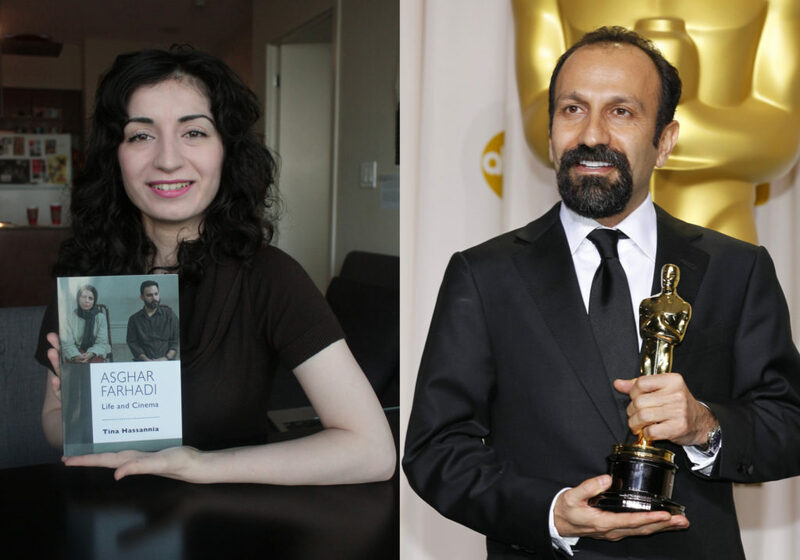 Asghar Farhadi and Salesman star Taraneh Alidoosti talk about their decision to not attend the 2017 Oscar ceremony due to the US administration’s recently-imposed travel ban. We spend much of the middle segment offering protest speech advice to anyone attending the Oscars. Lee has an incredibly helpful video guide on Academy Award etiquette that aired almost exactly ten years ago, which features a segment on the dos and don’ts of Oscar protest speeches. Asghar Farhadi previously won an Oscar for A Separation at the 2012 ceremony, Iran’s first ever win for Best Foreign Language film. Watch his moving speech here. The Oscar speeches weren’t quite as political as we were anticipating, but that doesn’t mean the evening wasn’t devoid of strong opinions and activism. Here’s Time Magazine‘s roundup of the evening’s political moments. You can read Tina’s review of Farhadi’s latest film The Salesman in Canada’s National Post. And you can read Sophie’s review of The Salesman in Literal Magazine. 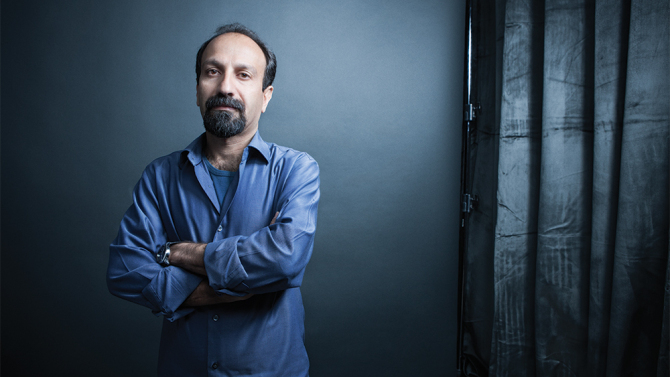 Here’s a great piece by BFI Head of Festivals and London Film Festival director Clare Stewart about the importance and impact of Asghar Farhadi’s films. As you now know (but we didn’t yet at time of recording), Asghar Farhadi’s The Salesman won Best Foreign Language Film at the Oscars. He was, as we know, not there to accept the award, but had Iranian-American businesswoman Anousheh Ansari—the first Iranian to go into space—read out a statement on his behalf, which can be both viewed and read here. 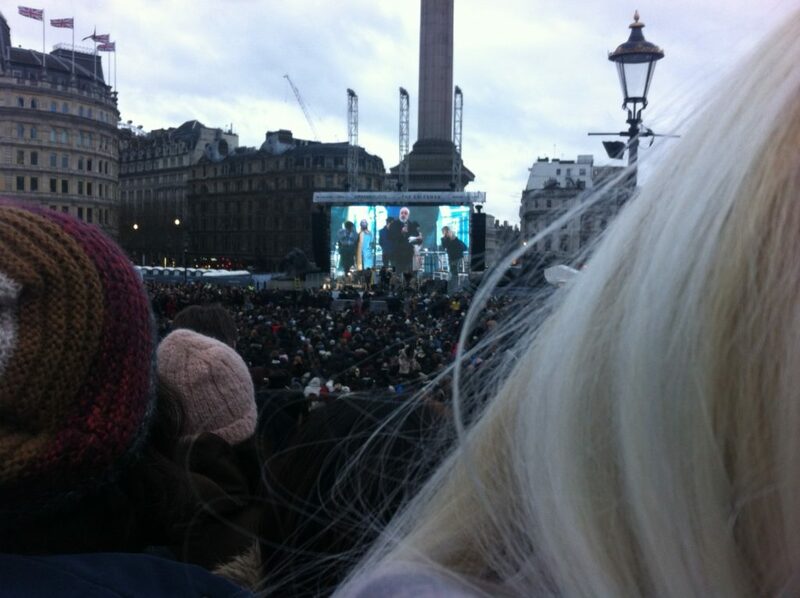 If you want to see the video of Asghar Farhadi’s message to the audience in Trafalgar Square, Curzon Artificial Eye has posted the video here. Sophie described the evening, the speeches and the mood of the crowd in an article for Sight and Sound, available here on the BFI website. Don’t forget to pick up Tina’s book Asgar Farhadi: Life and Cinema, featuring critical analysis of his work as well as interviews with the man himself. You can read an excerpt on the Toronto International Film Festival website. You can listen to Tina’s podcast Everything But Sports, co-hosted by Mallory Andrews, on Soundcloud or subscribe on iTunes. The latest episode of Hell Is For Hyphenates, featuring Tina Hassannia talking the films of Asghar Farhadi, can be heard on Stitcher Smart Radio, subscribed to on iTunes, or downloaded/streamed via our website. 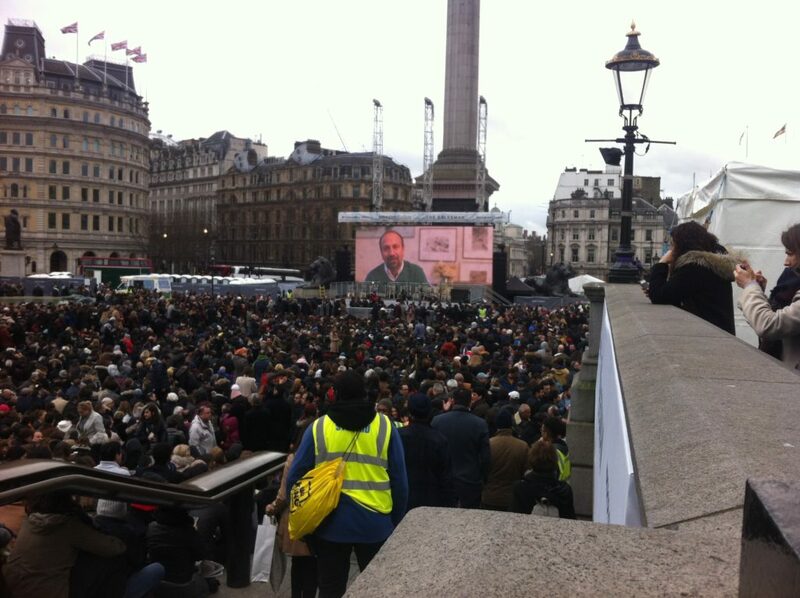 Thousands gather in Trafalgar Square for the screening of Asghar Farhadi’s The Salesman. “Whether you’re from Iran or Iraq, Streatham or Shoreditch, Lebanon or London, you are welcome.” London mayor Sadiq Khan. Filmmaker Mike Leigh sings the praises of his friend and colleague Asghar Farhadi. 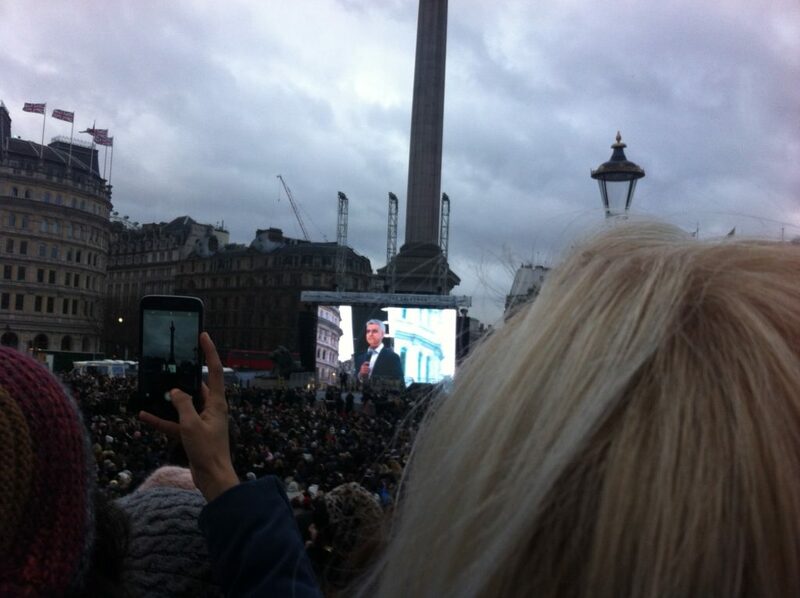 Asghar Farhadi speaks to the London crowd in a specially-recorded video message. This entry was posted in blogs and tagged asghar farhadi, tina hassannia on February 28, 2017 by The Hyphenates. Asghar Farhadi hit the headlines for all the wrong reasons recently: instead of celebrating the Best Foreign Film Academy Award nomination for his sixth feature The Salesman, coverage concentrated on his entanglement in the Trump travel ban, as both Farhadi and the film’s star Taraneh Alidoosti stated that they would boycott the awards over the block on Iranians travelling to the US. The Salesman is their fourth film together – and the third was About Elly, which got an international release after A Separation gave the director his (hopefully first of many) Academy Award in 2012. 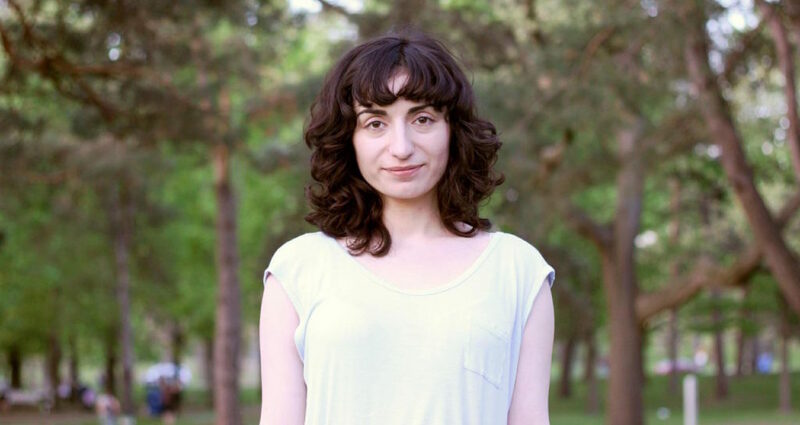 Alidoosti played the titular Elly, a shy teacher swept along on a group trip to the seaside by Sepideh, whose daughter is in her kindergarten class. Along with the three couples who’ve known each other since law school, there’s another single guest, Ahmad, and Sepideh has plans to get him and Elly together. Romantic comedy turns into a sickeningly tense he said/she said thriller when Elly disappears and Sepideh’s half-truths come to light, subtly shading the complicit and compromised lives of Tehran’s middle classes. That’s even more palpable in A Separation, where a planned divorce leads morally-upright Nader into a compromising situation: after his wife Simin leaves him to live with her mother, prior to her moving to the US to escape theocratic oppression, he hires Razieh to look after his Alzheimer’s-afflicted father. Both the grandfather and very bright daughter Termeh are caught in the battles of wills between the parents, as well as the class agony between Nader and Razieh, with a sense of consequences that many critics have compared to Michael Haneke’s Caché. Things can’t end well. Substitutions: If you can’t get or have already seen About Elly or A Separation, you must watch the film his two subsequent films: The Past (2013), which replays some of the themes of divorce, betrayal and children bearing the brunt of adult struggles seen in A Separation, but with the added knife-twist of cross-cultural relationships and immigration, as Farhadi shoots in France. And then there’s The Salesman (2016) is a drama about drama, going back to the filmmaker’s roots in studying theatre. It follows a couple whose relationship frays during their participation in a production of Death of a Salesman, as they confront the scandalous past of their apartment’s previous tenant. What’s past is, as ever in Farhadi’s films, all too poignantly and unsettlingly present. 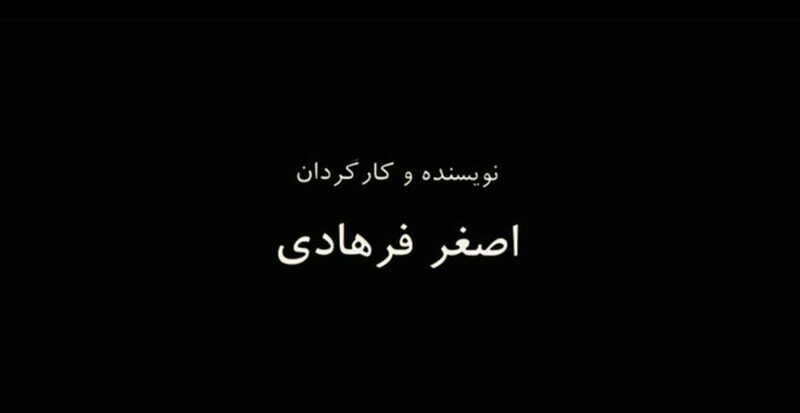 The Hidden Gem: Set on Iranian New Year’s Eve, Fireworks Wednesday (2006) is punctuated by small explosions, literal and metaphorical, as Alidoosti’s character Rouhi, a bride-to-be, gets sent by her employment agency to clean for a warring married couple: Mojdeh is convinced Morteza is having an affair; Morteza thinks Mojdeh is crazy. Rouhi spends a long day caught between them, their son Amir Ali, their beautician neighbour Simin, and the febrile celebratory atmosphere outside. The next episode of Hell Is For Hyphenates, featuring Tina Hassannia talking Asghar Farhadi, will be released on 28 February 2017. This entry was posted in blogs and tagged a separation, about elly, asghar farhadi, cheat sheet, fireworks wednesday, the past, the salesman, tina hassannia on February 22, 2017 by The Hyphenates. We’re breaking convention to do things a little backwards this month. Let us explain. 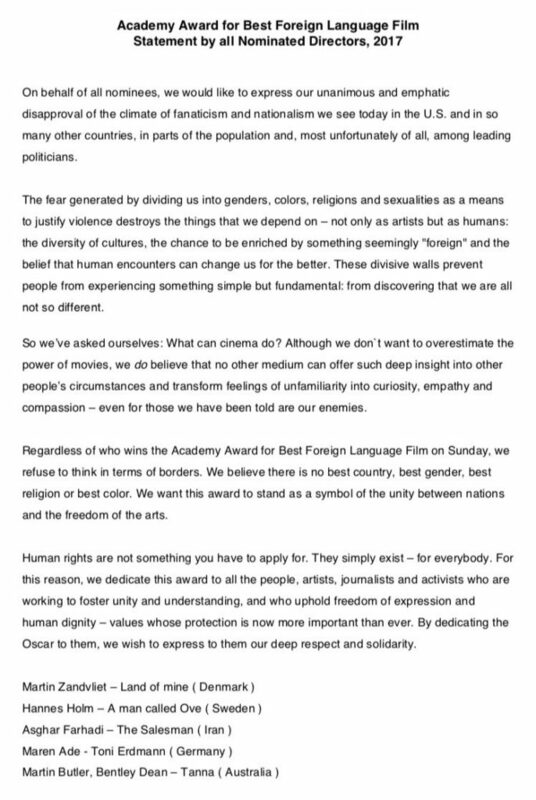 Before we had confirmed a guest or filmmaker for this month, it was announced that director Asghar Farhadi would be unable to enter the United States to attend the Oscars ceremony – he is once again nominated, by the way – thanks to sudden, draconian, poorly-implemented immigration policy. Farhadi’s plight is not the most heartbreaking story to emerge in the past month, but it is emblematic of how ridiculous this action has been. It became clear that this is something we would have to address on the show, probably during the middle segment. Then we realised there would probably never be a more appropriate time for us to discuss the films of Asghar Farhadi, so we decided to do something we’d never done before: we choose the filmmaker first. This month, Hell Is For Hyphenates will be all about the incredible films of Iranian director Asghar Farhadi. With our filmmaker-of-the-month selected, we then set about searching for the perfect person to help us discuss him, and there was really only one choice: Toronto-based film critic Tina Hassannia. Tina wrote the book on Farhadi, quite literally: Asghar Farhadi: Life and Cinema was released by The Critical Press in 2014, and is available from the Critical Press website, Amazon, Barnes and Noble, and Indigo. 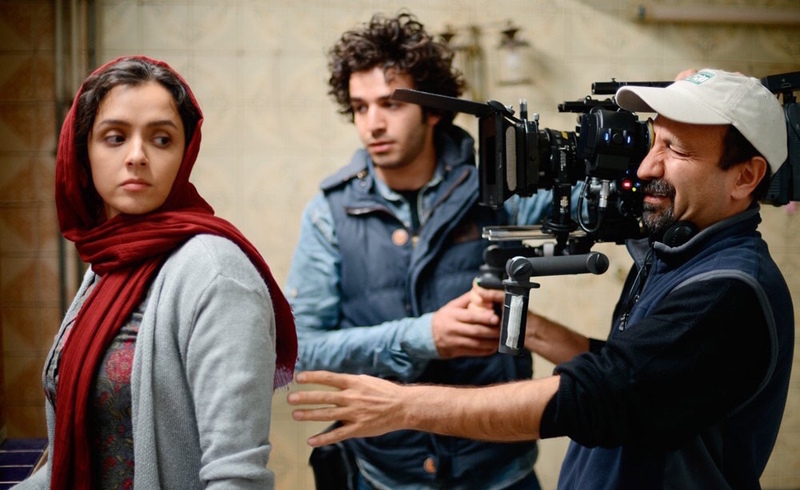 In the book, Tina traces Farhadi’s origins as an emerging filmmaker in Iran, from his directorial debut Dancing in the Dust through to 2013’s acclaimed The Past. The book also features an in-depth interview with Farhadi, and is undoubtedly the definitive work on this influential filmmaker. We were delighted that Tina immediately agreed to join us on the show, and cannot wait to discuss Dancing in the Dust (2003), Beautiful City (2004), Fireworks Wednesday (2006), About Elly (2009), A Separation (2011), The Past (2013), The Salesman (2016), as well as Farhadi’s career and history with her. This episode will also feature something else we’ve never done before, but to find out what that is, you’ll have to listen to the show when it’s released on 28 February! This entry was posted in blogs and tagged asghar farhadi, tina hassannia on February 10, 2017 by The Hyphenates.